So deciding to finish my shapeoko of ve been trying to print some cable chains and here are the picture of the selection I printed. I wanted big ones but the time it takes to print them was also a factor in which ones I eventually print. Some failures down to print errors mainly due to how filament was feeding of the spool. I have now decided that from now on I am going to buy the filament on the larger reels, the white ones seems that the filament is wound too tight so it doesn't freely come of when the less material on the spool. Also I have been trying to do lithopanes of my grandson Evan Andrew Summerfield who passed away in march, these are very tricky to do but did a couple, didn't come out that brilliant but not to bad for the quality of printing I was getting on other parts. As I have started using hairspray which works a treat getting 1st layer down so the 1st layer issue has gone, getting my head around cura and speeds is really getting the hang of it and now cura is always used over Slic3r, just the filament feed issue I have, so I decided to experiment in having the the pla cut into shorter piece so it was more freely to get fed in machine instead of having it coming of a spool, but the first item I started printing I was thinking I did not have enough filament to finish the object, so this is the time to see if I can change filament colour, so I hit filament change on the lcd then it finished and homed to change filament which went surprisingly easy with the flex3drive and started printing again, It went quite well but forgot to adjust the idle screw so 1st layer of new colour did not fully extruded but went ok but eventually failed further up to a layer alignment issue. so aborted print. but i thought id do the same on a vase change colour which went really well. There was some filament feed issues as you see on some of the light blue areas, but now it bewilders me why on such a big object I 90% good quality and without a cancel print but on smaller multiple part prints about 60% quality. I would be happy if i was getting same quality on parts for shapeoko as the quality of the two colour vase people may think that that broken layer is bad, but I am not looking top notch visual quality but functionable quality for mechanical parts. Im putting the ultimaker build on the backburner as I have a shapeoko 2 needs finishing. So I have changed to printing parts for the shapeoko 2 no which one is the cable chain. Theres loads of models out there which I have tried to print before but they never seemed to be big enough for the cables im going to route through. I found a shapeoko hd drag chain model and printed four chains out. It was fun trying to rub pritt stick on bed after noticing that part of the outer brim was laying down. 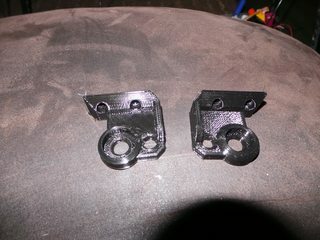 When I got too the overhang I went to myself dam these need support so I stopped the print. Well what can i say the increase of 3d printing and reprap has gone through the roof the past 3 yrs i've own my i3, now the issue with all the cheap chinese i3s and different companies jumping on the band wagon it seems they miss out the vital information to the user, Calibration. Reprap machines are not plug and play I have had mine 3yrs, swap few things around and still i don't think it's calibrated enough. 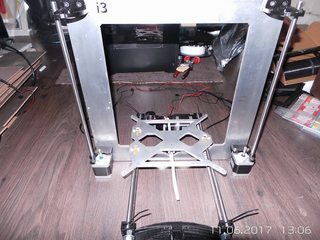 Starting my I3 when Prusa mendal I2 was basically fully developed, was difficult because there was only few out there and not many variations, and its annoying to see on forums how many people struggle with these cheap kits or others, their down fall is they try to give you instructions how its built and where things go from their instruction as if its their design and their product. I have been having issues with 1st layer my bed at 60 degrees and printing pla, I had 1st layer set at 0.3 and i was squashing it down to 0.1mm because of my z offset to prob was properly configured. That goes to show that there's always something that's not calibrated proper and myself never spent time calibrating the auto leveling bed aspect when i put it in place a year ago. and squishing the 1st layer worked apart from im 0.2mm different on the z height on parts, which isnt good because i want parts with correct dimensions. 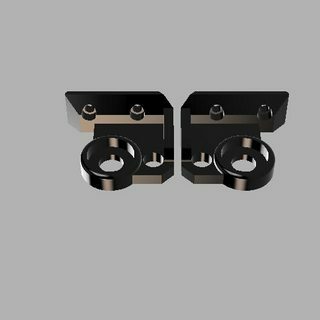 I thought I would start a fresh page to tell you what I am trying to achieve, I have got to a stage where I need to think about how I can print more parts at once as I want to try print quantities of reprap parts and print freelance work. I need to make this become another source of income to fund future developments. Down to having a good learning machine which was built from ground up by sourcing parts and learning cad and calibrating it to do decent prints. Along the way its been a journey, things breaking things need fixing, upgrading various bits and doing test prints all the time. I chose the Ultimaker because I think for the frame will be cheap for me to build by using hopefully Fablab Devon laser and sourcing the 6mm birch plywood, there are bits which I cut cost down on the frame as I am only using the frame parts, the rest will be 3d printed parts with a aluminium bed plate for heatbed. The is another reason because the printed parts to me look like the best upgrades. Hi just a little update finished the set of reptars they took 25 minutes each, the quality improved but comes to my conclusion about 1st layer issues, I had done few first layer calibration as 1st layer is squashed in bed so I was adjusting the z offset to get my desired 0.3 1st layer height, when I actually got in do partial of the 1st layer at 0.3 it didn't bond to the bed good, I may possibly maybe try bed at 70 next time, but definitely will using p1000 sandpaper and sand nozzle and run a 0.5mm drill bit through it if i can find one in my tool box, just because 80% that's probably more the issue why then the bed not being hot enough, for now I will just squish the 1st layer down I lose about 0.5mm in height but that's a tolerance i can live with until I clean nozzles but the quality of over layers have vastly improved with faster speeds I have previously done last year before I had the break. Well went back to calibration prints try get a bit better reliable prints after having blobs perimetar on 1st layer I decided to print calibration cubes. Thanks too my friend on irc who told me to change a few things, which has improved my printer. Now I have the flex3drive working properly I did my first cube in slic3r experimental and took of retraction I got a .4 nozzle so set everything to extrude 0.4mm width and layer height it started not extruding so I put temp up from 200 to 210 and flow too 200 on the lcd controller print went better. So i started again thinking it can't be the flow so kept that same and raised temperature and printed the 2nd cube which ended up with a layer change upper part of the print but looked ok, apart from that i must be having my heatbed to hot notice the colour and wavey layers at bottom. So i decided now the quality im expecting from this machine may not for some but understand, this printer wasnt bought as a kit parts was singley sourced and built by myself when there was much write up how to assemble it and not many decent modifications out there. Sorry guys and girls for not updating my blog for a while things have taken a backseat for a while as my other hobby is carp fishing and hards to balance work fishing and family life and mess around with my 3d printer so it has been collecting dust for a while. I have got it going again as want to make some fishing item but started to get the bug back which im also glad i Won't be spending much time but im going to spend time I have started to do more test prints things have failed but im very pleased that nothings really changed as in the condition of the print errors i had before.